The physical and mechanical properties of wood vary hugely – not just between species, but also within species, from forest to forest, between trees in the same forest, and even within a single tree. For structural timber, certain key properties need to be assessed in order to ensure building safety, and economic use of the material. The means by which this is achieved is known as “strength grading”, and sometimes by the old terminology “stress grading”. In Europe (including the UK, even after Brexit), structural timber is graded under the system set out by the harmonised European standard EN14081. It sorts rectangular cross-section timber into grades based on requirements for three primary grade determining properties. For normal construction timber those are bending strength, bending stiffness and density. The reference moisture content for these properties is 12%, irrespective of the moisture content at which grading is carried out. Strength and density are specified as fifth percentiles and stiffness by the mean – these are known as the characteristic properties, and are probabilistic descriptions rather than properties of any single piece of timber. This way of expressing properties fits to modern design codes like Eurocode 5, and is a different way of expressing properties from the old permissible stress design codes like BS5268, and old books. Nevertheless, the basic principle of grading remains the same as it has been for decades. There are two parallel systems for grading: visual and machine, both of which follow the same fundamental basis: timber is sorted into grades according to a non-destructive assessment that is predictive of the grade determining properties. The collective characteristic properties of the timber sorted into those grades determines the strength class. A strength class is simply a grade with associated numbers for strength, stiffness and density that can be used in design. Strength class is usually specified with reference to EN338 (e.g. C16, C24, D24 and D30), but properties can be declared directly, or by means of a user-defined strength class. Remember, those numbers describe populations of timber (the timber sorted into that grade) and not individual pieces. Grading therefore depends not just on the grading rules or machine thresholds, but also the population prior to grading. This is why it is not allowed to visually grade timber rejected by machine grading, because the machine grading changed the original population by removing the better pieces from it. A number of additional “visual override” checks are needed to cover things like drying distortion and fissures. It is whether those are carried out after drying that determines whether timber can be described as “dry-graded”. A more detailed explanation of strength grading can be found in this paper (although it is now little out of date on some detail since the revision of EN14081-2). Visual grading is carried out according to grading rules that are usually (but do not have to be) national standards (like BS4978 for softwoods and BS5756 for temperate hardwoods). Assignment to a strength class is specific to a combination of grading standard and timber source. The assignments for UK grown timber all quite old, and not all of them are listed in the European standard EN1912. It covers British spruce (Sitka and Norway spruce), British pine (Scots and Corsican pine), larch (European, Japanese and hybrid), and Douglas-fir. The ones for large cross-section Douglas-fir, oak and sweet chestnut are instead in PD6693, which is merely a published document from BSI. There is no reason, other than cost, that prevents new test data updating these grading assignments, or adding assignments for other UK grown timber, but with the new generation of portable and lower cost grading machines it may well make more sense to use a machine assisted visual grading process to improve yields and assignments. Slovenia has recently introduced a simple grading machine “STIG” based on a tablet computer and microphone, which measures the note (frequency) a piece of timber makes when struck with a hammer. This is essentially all that acoustic machine grading involves, and since this is a kind of measurement of the timber’s stiffness it is usually a more powerful grading predictor than knots, ring width and slope of grain. While the density also affects the frequency at which the piece of timber vibrates, the overall density of the piece is usually a much less useful indicator of timber quality than the stiffness. 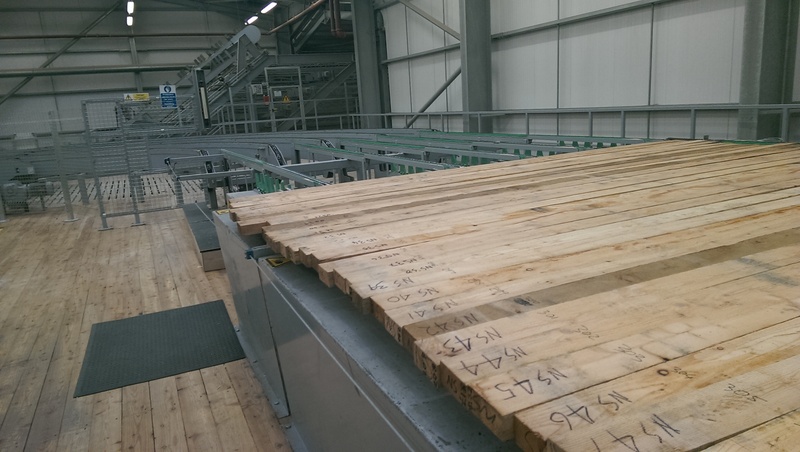 Most machine grading of timber in the UK is now done with x-ray machines, which measure wood density in detail as well as the size and position of knots. The machines are much faster than the old bending-type machines, which worked by measuring the timber stiffness in mechanical bending (not by proof loading). But modern grading machines more commonly measure stiffness by the acoustic vibration method, allowing them to be much smaller and simpler. 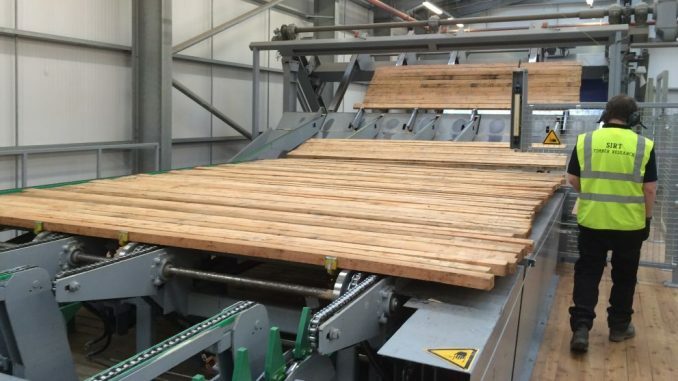 There are now many kinds of grading machine, including ones that work on other principles such as slope of grain, but only a few have settings approved for UK-grown timber.